A new-build 27 metre motor yacht, a Sanlorenzo SX88 Crossover model, has been sold to an Asian client with the buyer introduced by Nick Stratton at Simpson Marine in Hong Kong. To be built in GRP by Italian yard Sanlorenzo with an exterior design by Officina Italiana Design and an interior by Lissoni Associati, the new yacht is scheduled for delivery to Asia in mid-2019. The styling incorporates several new elements, such as an open transom, which allows both a 4.57 metre tender and Jet Ski to be loaded onto a 30 square metre bathing platform via an integrated davit crane. 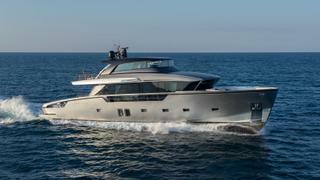 Moving further forward, the reverse-angled windshield adds to the SX88’s explorer yacht aesthetic. The asking price of the Sanlorenzo SX88 has been withheld but this model usually retails at €5,500,000.